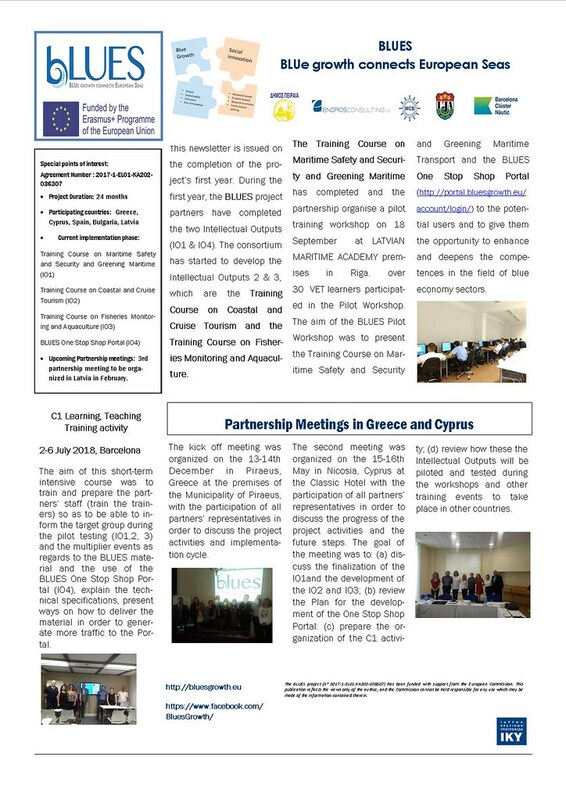 The BLUES consortium is glad to announce that the first edition of the BLUES project newsletter is out! BLUES is a co-funded project by the European Commission under Erasmus+. The consortium consists of 5 organizations, coming from 5 different European countries. The project coordinator is the Municipality of Piraeus with partners being Enoros Consulting Ltd, Marine Cluster Bulgaria, Latvian Maritime academy - Latvijas Jūras akadēmija and Barcelona Clúster Nàutic. The overall objective of the project is to promote the development of blue economy in the partner countries, strengthening cooperation between industry and education, to fill the skills gap in this sector and to raise awareness of Blue Careers and tools via the creation of a dedicated One Stop Shop Portal which also accommodate the e-learning Training Courses of the project.